On January 26, over 50 members of Dallas City Temple Seventh Day Adventist Church traveled to El Paso for Mission: Possible, an encounter coordinated by Faith in Texas and HOPE Border Institute. Members had the opportunity to meet with local community groups, participate in a march against the border wall, and help out at the Annunciation House shelter. 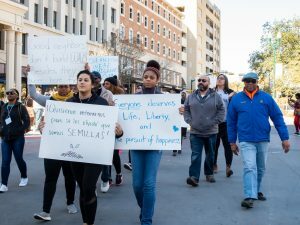 City Temple wanted to give its members an opportunity to move beyond the headlines and experience the border for themselves, guided by the people who are directly impacted by border policy. 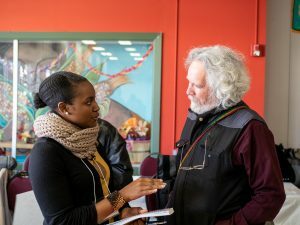 “Being able to connect, to touch, to feel, to see––to get the news directly from the individuals who are on the front lines doing the work was super important,” said Pastor Jaime Kowlessar. City Temple members heard the stories of the women of La Mujer Obrera, a local independent organization dedicated to creating communities defined by women. Their organization was founded in 1981 by women who were both garment workers and Chicana activists. Over the years, La Mujer Obrera has been one of the leaders in the struggle against an “undeclared war” on marginalized women workers of Mexican heritage. One of their leaders told of their struggle to protect workers, ensure their children receive a fair and equitable education and define their own communities as large industrial entities seek to change their neighborhoods. 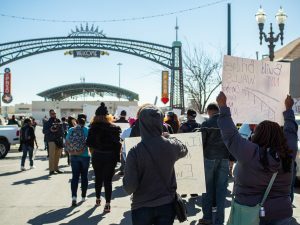 City Temple also joined a march led by the Border Network for Human Rights to protest the expansion of the border wall in El Paso. As the march progressed, some members crossed the border to Ciudad Juárez to experience the border crossing for themselves and gain a better understanding of how the two communities exist together, separated by the border. The group finished the day by assisting volunteers at Annunciation House, which provides shelter to hundreds of undocumented people every week. 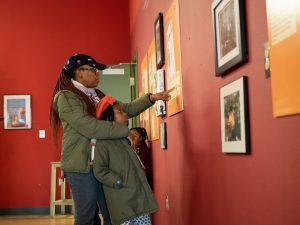 Visitors learned that asylum seekers are often released from ICE custody with nothing but the clothes on their backs and nowhere to go for shelter or support. Annunciation House works with area churches to provide short-term shelter and support to migrants, including medical care, transportation, clothing, and food. Members met with the head of the shelter to hear stories of migrants, and to learn about Annunciation House’s mission. 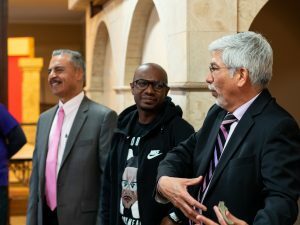 “We have so many groups of people that are being oppressed and marginalized, and with all the resources and privileges we have in America, we should be on the front lines to alleviate the pain and suffering that they are dealing with,” said Pastor Kowlessar after hearing the stories of asylum seekers from Guatemala, Honduras, and Ecuador. 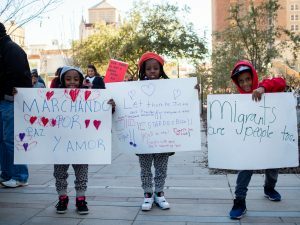 “Martin Luther King Jr. said, ‘Silence is betrayal.’ I don’t want to betray these individuals or myself by being silent.” Pastor Kowlessar and Dallas City Temple have pledged to return to the border to share the experience with more of their members, as well as other congregations in DFW. Until then, they are working with Faith in Texas’ LA RED Campaign to ensure that migrants in North Texas are seen, heard, and supported. Huge thanks to HOPE Border Institute, La Mujer Obrera, and Annunciation House for making Mission: Possible, possible!